Partnership award recognizes Rice Stewardship efforts. (l-r) Bob Whitson, Monty Dozier, Dennis Neuman, Taylor Abshier and Parr Rosson. 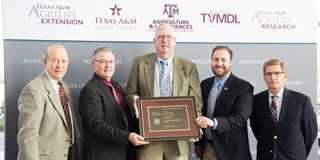 DU received a Partnership Award from Texas A&M AgriLife Extension Service in January 2019. The Texas A&M AgriLife Extension Partnership awards honor key individuals, organizations, agencies and others outside the Texas A&M University system whose dedicated support and excellence have significantly enhanced the impact of Extension programming. DU shares the Extension’s mission of protecting the environment. Across Texas, DU has worked to conserve more than 245,500 acres of rice fields, prairie wetlands, and associated coastal marshes that provide important habitat for hundreds of thousands of white-fronted geese, several species of diving ducks, mottled ducks and other species of puddle ducks. Ducks Unlimited, working with the Lower Colorado River Authority, Texas A&M AgriLife Extension Service and several other national, state and local partners, coordinated efforts to secure an $8 million federal partnership award for the Prairie Conservation Reservoir Project, a new reservoir in Colorado County. The project will increase water reliability and improve agricultural water-use efficiency with the Lakeside Irrigation Division while providing more flexibility to support downstream demands and enhancing waterfowl habitat.